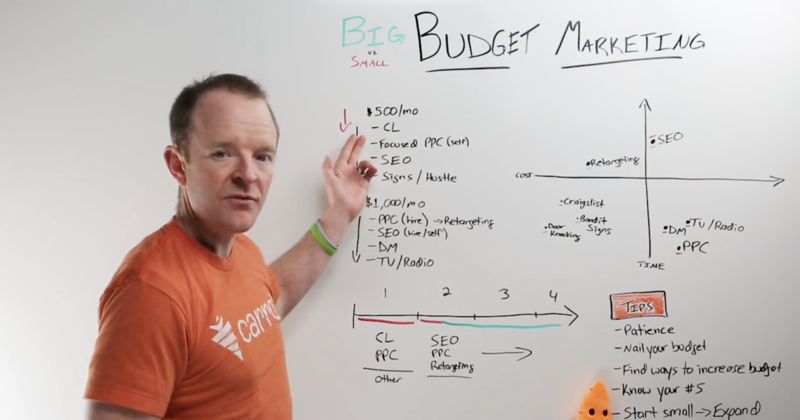 Big vs. Small Marketing Budget: What Marketing Should You Focus On As A Real Estate Investor? People often ask me about marketing. Everyone should have a strategy, but the breadth of that strategy is at least partly determined by your budget. Believe it or not, whether you have less than $500 or over $1,000 per month in your marketing budget, there’s a strategy for you. We have Super Carrot (the doll) on this Carrot Whiteboard Strategy Sketch and if you are a current customer and don’t have Super Carrot yet, connect with our support team, relay the successes you’ve had in the past 60 days, and we would love to send a Super Carrot or Farmer Carrot to you. I closed a $38k deal from Palm Beach using SEO and our Carrot site. I’m going to walk you through how to invest so that your marketing ROI stands a better chance at coming out positive. I’ll show you how to build a strategy with under $500 a month, and then with over $1000 a month. First, though, you need to have a realistic perspective on how much money you can invest, and how much you expect in return. 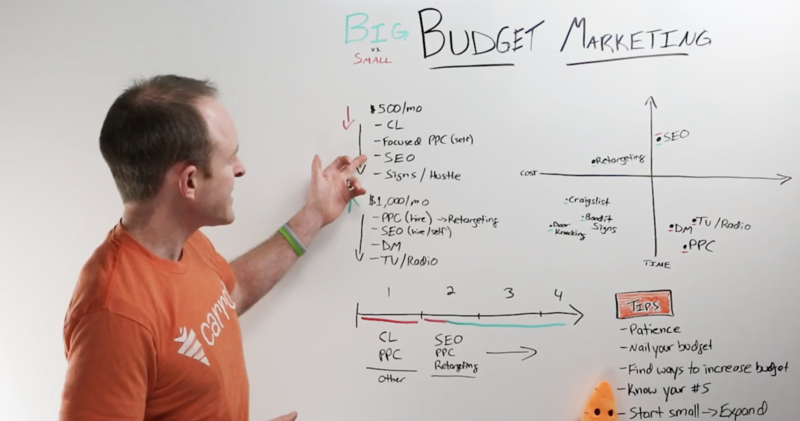 To help, we have an entire whiteboard strategy sketch on that topic: how to calculate your ROI. With less money comes… more responsibility. At least in the sense that you have to be more careful how you spend what you have. If your budget is well below $500, I recommend some bold moves: knock on doors, join Facebook groups, use bandit signs. If your budget is slightly more forgiving, direct mail is a great next step. It will take some time — it’s called snail-mail for a reason — but will be well worth it if done correctly. But enough… onto the gold. If your budget falls under $500 a month, below is what I suggest you start with. 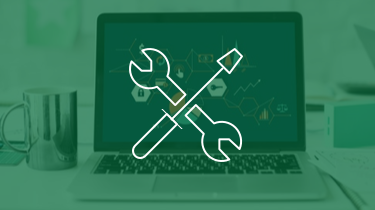 If this isn’t extensive enough for those of you who’re savvy marketers, go dive into our other resources to learn how to do each one of these in even more detail. Craigslist is a free, mind-numbingly-easy tool at your marketing fingers. If so inclined, you can start posting Craigslist ads in your market right now in about 5 minutes. Hey are you looking at selling your house? Hey I know you’re trying to rent your house, but I’d be interested in buying this property from you. If that’s something you’re open to discuss, let me know. You might be surprised at their response. But don’t just seek out sellers, let them seek you out. Two ads in the morning and two ads in the evening. Over a period of four to six weeks, ramp it up to four ads in the morning and four ads in the evening. Then see if you can get it higher depending on the market. Possibly working up to five ads in the morning and five ads in the evening. And yes, the timing of your ad matters. 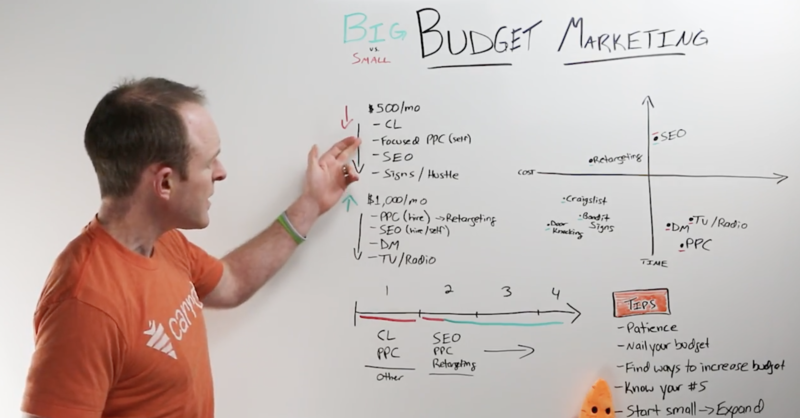 If you have the money to invest in PPC, it’s worth your time to learn the basics. Better to start meager instead of ambitious, so to begin, set a small budget and choose your keywords carefully. To do so, don’t avoid our keyword report which removes the guesswork and makes for a comfy and confident ROI. SEO is your next move. Since your budget is below $500, you’ll probably do SEO yourself. Check out our training to help you gain the footing you need to do so. However you learn it, don’t skip this step. SEO is critical for any successful marketing campaign. The good news is that, since you’re doing it yourself, it won’t cost you a nickel. But… it will take some time to learn and some time to see results. Keep at it and be patient with yourself. Depending on your choice of keywords and how well you implement your SEO plan, it could be up to 12 months before you see results. But remember, you’re in this for the long-term, so it’s a worthwhile investment. For short term satisfaction, nail down Craigslist, bandit signs, pay-per-click, and even retargeting ads. SEO is an end game play. One you should invest in if real estate is more than a hobby, which I’m betting it is. With over $1,000 a month, marketing looks a bit different in terms of who’s doing the groundwork. PPC. Outsource if possible. 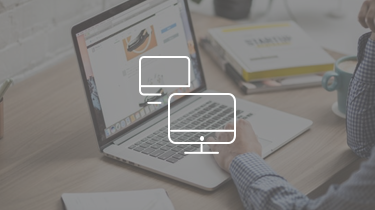 Good PPC management for your agenda will specialize in the real estate world. Pay a team member to do Craigslist ads using the same ad distribution process mentioned above. Use a retargeting ad campaign. Pay someone to set up an SEO foundation. I found a keyword phrase I want to dominate, but what do I do next? I am stuck with a small marketing budget, what should I do? We’ll answer these questions for free, simply because we want to see you succeed. For additional big-budget marketing, consider direct mail, radio, and television ads to see if they’re viable. Some of our biggest clients claim that TV is their number one source of advertising. Maybe it’ll be the same for you. Don’t be afraid to try different marketing tactics to discover what does and doesn’t work. Implement these tips, but remember that everything worth doing takes time. With online marketing, patience is king. Especially if you’re focusing on SEO. Stick with it, even when you don’t see results in the first couple months. Watch me build my traffic this next month! My recommendation. Commit to a marketing strategy for six full months. Here is my budget for six months. I’ll use my money wisely and do my best. In half a year, I’ll see how far I’ve come. If your budget is strangling your marketing potential, try to find ways to increase your budget. If your budget is working, still try to find ways to increase your budget. In other words, always try to invest more into marketing, because it does make a difference. What is your average profit per deal? What are my leads to conversion ratio? Knowledge is power. And, in marketing, without knowledge, you’re powerless. 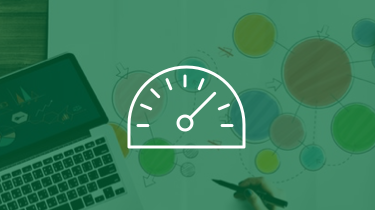 To have a flexible marketing strategy that allows you to experiment, you need to know your metrics. We have an entire Carrot Strategy Sketch on that topic. Check it out. Marketing is a huge world, as full of potential as it is of unknowns. This gives you a place to start, but for further instruction, visit our Carrot Strategy Sketches, CarrotCast podcasts, and blog posts. If you’re a Carrot customer, don’t hesitate to hit us up on our weekly Coaching Calls where we dive into strategy, every single week. If you crush it, we crush it. Let’s do this! Please have someone contact me for pricing. Hey Dane! Done! Pete on our team will reach out shortly.